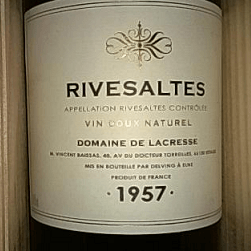 The quality Rivesaltes 1957 wine is a great birthday gift. The wine will carry high alcoholic level at 17% so the wine will last for well over 60 years, Robert Parker 93 points. You can upgrade to a wooden bar set. The 1957 Rivesaltes from Domaine La Sobilane is noticeably darker in color than coeval vintages. The bouquet is a little smudged, but gains some clarity in the glass: burnt toffee, walnut, just a touch of volatility and a light sea spray influence. The palate is medium-bodied with marmalade, stem ginger, rhubarb and white pepper, well poised with a long tail on the finish. The ranks alongside the excellent 1956.